In North Carolina, occupational regulation tends to be an all-or-nothing thing. Either the state applies the most extreme form of regulation (licensing), or it mostly leaves the occupation alone. This approach means North Carolina licenses more occupations than most states. It also means that when industry interest groups go to the legislature to address problems in their field of labor, they often ask for licensure to address them. It seems like the only way. This paper calls for an overhaul of North Carolina’s approach toward occupational regulation. 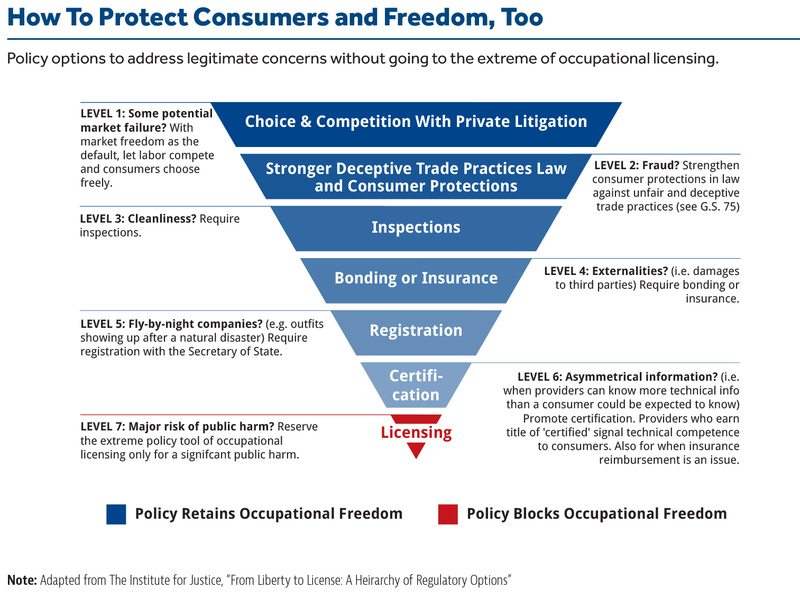 It argues for reforming occupational licensing for several reasons: legal, practical, and feasible. By design, licensing blocks people from simply entering their chosen field of labor. Only those who cross all the hurdles to get a license can ply their trade. Those hurdles can include licensing fees, school tuition and fees to obtain mandatory credentials or continuing education credits, sitting fees for qualifying exams, time spent gaining experience, time spent studying for classes and qualifying exams, opportunity costs of forgone work, and also satisfying licensing boards’ criminal background checks and “good moral character” requirements. In its 2015 ruling against the N.C. Board of Dental Examiners, the U.S. Supreme Court dismantled a long-held presumption: that state occupational licensing boards are automatically immune from federal antitrust laws. It is not clear how the state could demonstrate active supervision over licensing boards. 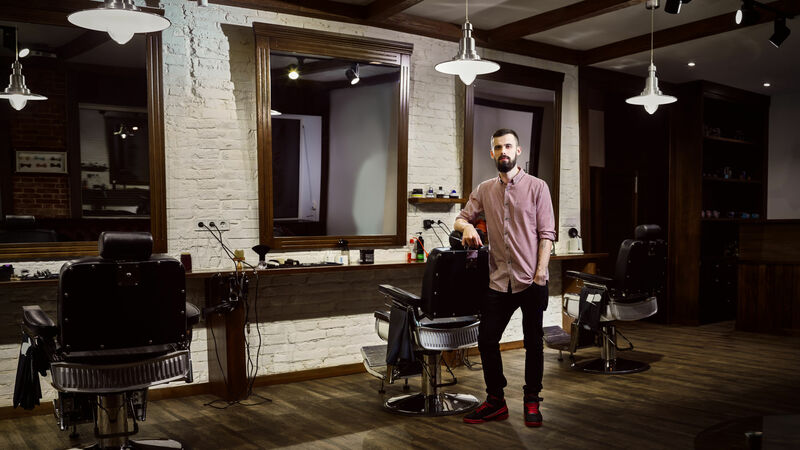 If the state were to free more occupations from the highly restrictive, all-or-nothing approach of licensing, however, that would eliminate anticompetitive concerns at their root. Right now, North Carolina’s approach to occupational regulation is too heavy-handed to meet these criteria. Leaving aside how state licensing could affect competition, North Carolina’s approach is not geared for keeping occupational regulation narrowly tailored to the policy issue at hand, nor to seek less restrictive alternatives to achieve the same goal. The Trump administration is committed to working with you to strengthen our economy and empower the American workforce. Americans want principled, broad-based reform. State leaders should know that the Trump administration is building on reform efforts started under the Obama administration.12 The federal government’s interest in state occupational licensing reform doesn’t appear to be a passing fancy. Note that not all of those bills pertain to licensing. The range and frequency of such bills year after year19 strongly suggest there is a need for a better approach. Finding such a balance has historically been difficult. For decades, nearly every attempt across the nation to free occupations from highly restrictive state licensing failed. In May 2015, the federal Bureau of Labor Statistics published a review of the previous four decades’ worth of de-licensing efforts. It found “only eight instances of the de-licensing of occupations over the past 40 years.”20 Only eight successes in 50 states over 40 years. 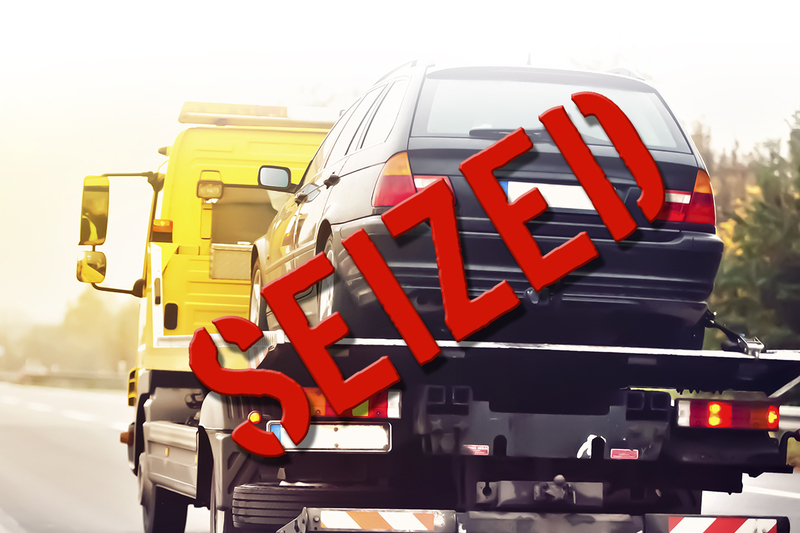 In just the past year, however, seven new de-licensing attempts have succeeded. As suggested above, the political landscape has changed. 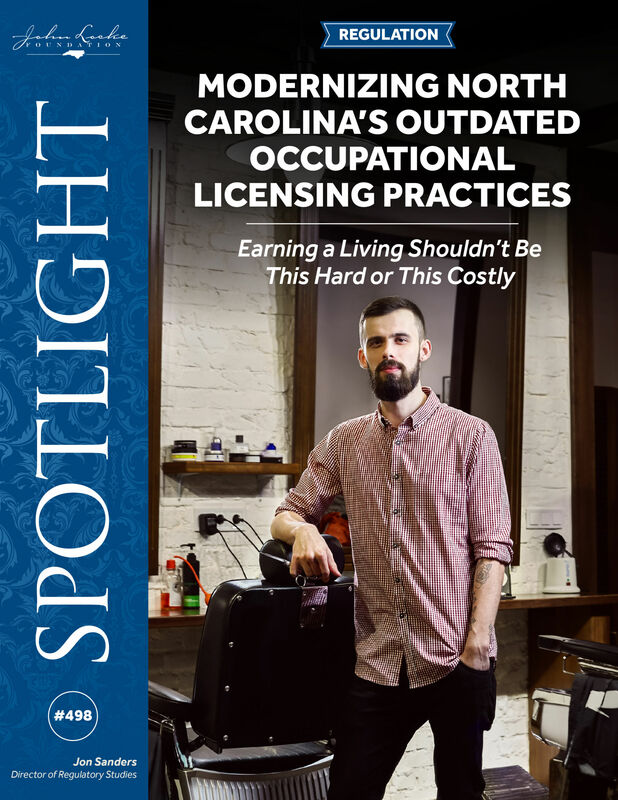 Since 2016, several states have succeeded in occupational licensing reforms. Those reforms can be put in two categories: removing certain required state licenses and changing the state’s entire approach to occupational regulations. Rhode Island, 2016: Gov. Gina M.
After decades of occupational licensing being nearly untouchable in state governments, several states have very recently made sweeping reforms. It’s not an aberration. 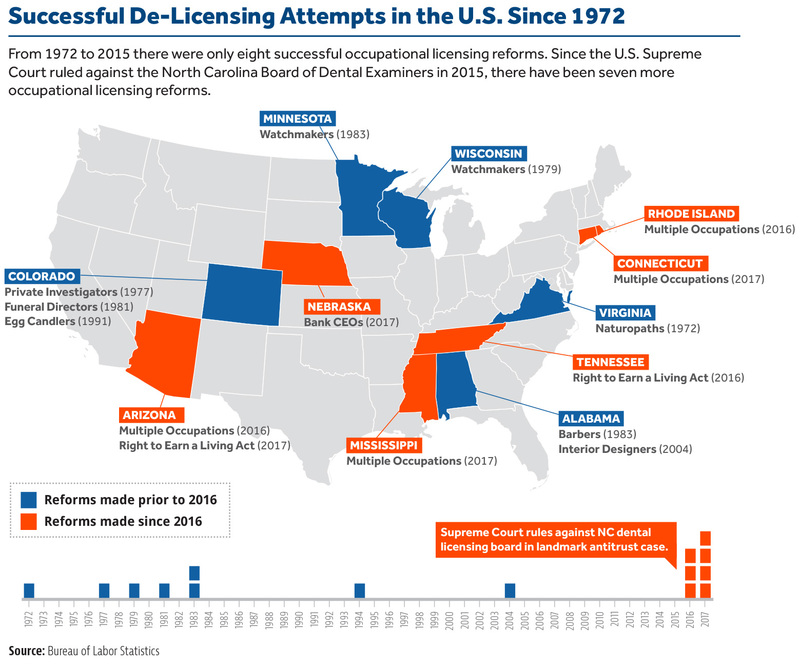 Those states show that modernizing a state’s approach to regulating occupations, including getting rid of unnecessary licensing, is a winning idea. Meanwhile, however, North Carolina risks being left shackled to an unwieldy, highly restrictive, and patently anticompetitive approach. The risk is not just being passed by states with more competitive labor practices. The risk is also from federal antitrust and other enforcement actions. What should North Carolina policymakers do? Who is pointing the way? Numerous industries in North Carolina come to the legislature each year with a range of concerns, most of which are unsuited for licensing even if they are legitimate concerns. Placing state entry regulations on some people’s chosen fields of labor should be a regulation of last resort, reserved only for the most extreme regulatory concerns. A state that recognizes its people have a constitutional right to “the enjoyment of the fruits of their own labor” should be extra careful its laws don’t tread on that right. The state’s involvement in an occupation should be conformed to the legitimate issue at hand, and then go no further. What would that mean? It means if there’s a significant concern about protecting consumers from fraud, then enhance the powers of the attorney general and the deceptive trade practices act. If the significant concern is over cleanliness, then require inspections. If it’s damage to third parties, require bonding. If it’s shady, fly-by-night providers, require registration. And if it’s insurance reimbursement or a knowledge imbalance, require certification. 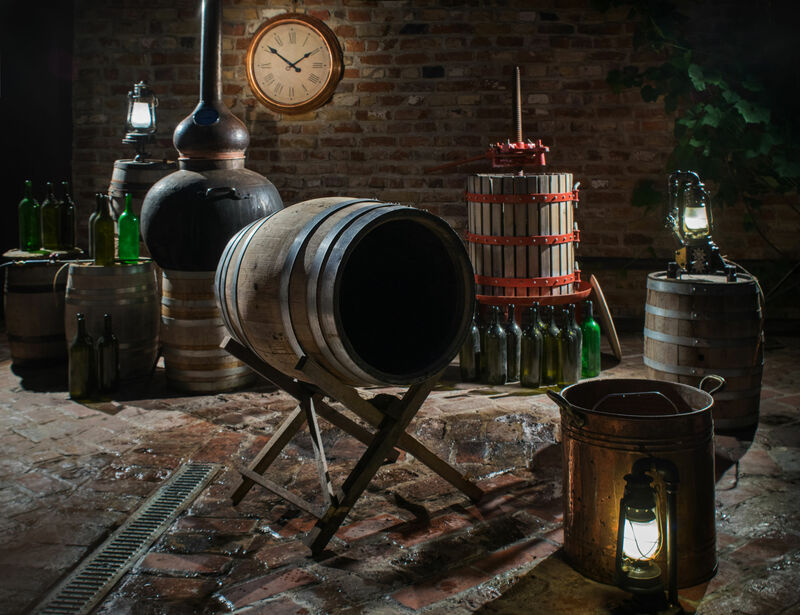 Unlike licensing, none of those policies would preclude North Carolinians from enjoying their self-evident right to the enjoyment of their own labor. SECTION 1. This act shall be known and may be cited as the “Right to Earn a Living Act”. (2) “Licensing authority” means any state regulatory board, commission, council, or committee in the executive branch of state government established by statute or rule that issues any license, certificate, registration, certification, permit, or other similar document for the purpose of entry into, or regulation of, any occupational or professional group. “Licensing authority” does not include any state regulatory board, commission, council, or committee that regulates a person under title 63 or title 68, chapter 11 or 140. (a)(1) No later than December 31, 2016, each licensing authority shall submit a copy of all existing or pending entry regulations pertaining to the licensing authority and an aggregate list of such entry regulations to the chairs of the government operations committees of the Senate and House of Representatives. The committees shall conduct a study of such entry regulations and may, at the committees’ discretion, conduct a hearing regarding the entry regulations submitted by any licensing authority. The committees shall issue a joint report regarding the committees’ findings and recommendations to the General Assembly no later than January 1, 2018. (2) After January 1, 2018, each licensing authority shall, prior to the next occurring hearing regarding the licensing authority held pursuant to § 4- 29-104, submit to the chairs of the government operations committees of the Senate and House of Representatives a copy of any entry regulation promulgated by or relating to the licensing authority after the date of the submission pursuant to subdivision (a)(1). The appropriate subcommittees of the government operations committees shall consider the licensing authority’s submission as part of the governmental entity review process and shall take any action relative to subsections (b)-(d) as a joint evaluation committee. Prior to each subsequent hearing held pursuant to § 4-29-104, the licensing authority shall submit any entry regulation promulgated or adopted after the submission for the previous hearing. (3) In addition to the process established in subdivisions (a)(1) and (2), the chairs of the government operations committees of the Senate and House of Representatives may request that a licensing authority present specific entry regulations for the committees’ review pursuant to this section at any meeting of the committees. (4) Notwithstanding this subsection (a), the governor or the commissioner of any department created pursuant to title 4, chapter 3, relative to a licensing authority attached to the commissioner’s department, may request the chairs of the government operations committees of the Senate and House of Representatives to review, at the committees’ discretion, specific entry regulations pursuant to this section. (5) The entry regulations are outside of the scope of the licensing authority’s statutory authority to promulgate or adopt entry regulations. (E) Is outside of the scope of the licensing authority’s statutory authority to promulgate or adopt entry regulations. (d)(1) Notice of the disapproval of an entry regulation promulgated or adopted by a licensing authority shall be posted by the secretary of state, to the administrative register on the secretary of state’s website, as soon as possible after the committee meeting in which such action was taken. (2) If a licensing authority fails to initiate compliance with any recommendation of the government operations committees issued pursuant to subsection (c) within ninety (90) days of the issuance of the recommendation, or fails to comply with the request within a reasonable period of time, the committees may vote to request the General Assembly to suspend any or all of such licensing authority’s rulemaking authority for any reasonable period of time or with respect to any particular subject matter, by legislative enactment. (e) Except as provided in subdivision (a)(2), for the purposes of reviewing any entry regulation of a licensing authority and making final recommendations under this section, the government operations committees may meet jointly or separately and, at the discretion of the chair of either committee, may form subcommittees for such purposes. Following is the text of the model Right to Earn a Living Act by the Goldwater Institute (reprinted with permission). (1) The right of individuals to pursue a chosen business or profession, free from arbitrary or excessive government interference, is a fundamental civil right. (2) The freedom to earn an honest living traditionally has provided the surest means for economic mobility. (3) In recent years, many regulations of entry into businesses and professions have exceeded legitimate public purposes and have had the effect of arbitrarily limiting entry and reducing competition. most heavily by individuals outside the economic mainstream, for whom opportunities for economic advancement are curtailed. (c) To ensure that regulations of entry into businesses and professions are demonstrably necessary and carefully tailored to legitimate health, safety, and welfare objectives. (A) ”Agency” shall be broadly construed to include the state, all units of state government, any county, city, town, or political subdivision of this state, and any branch, department, division, office, or agency of state or local government. (B) “Entry regulations” shall include any law, ordinance, regulation, rule, policy, fee, condition, test, permit, administrative practice, or other provision relating in a market, or the opportunity to engage in any occupation or profession. (C) ”Public service restrictions” shall include any law, ordinance, regulation, rule, policy, fee, condition, test, permit, or other administrative practice, with or without the support of public subsidy and/or user fees. (D) ”Welfare” shall be narrowly construed to encompass protection of members of the public against fraud or harm. This term shall not encompass the protection of existing businesses or agencies, whether publicly or privately owned, against competition. (E) ”Subsidy” shall include taxes, grants, user fees or any other funds received by or on behalf of an agency. All entry regulations with respect to businesses and professions shall be limited to those demonstrably necessary and carefully tailored to fulfill legitimate public health, safety, or welfare objectives. All public service restrictions shall be limited to those demonstrably necessary and carefully tailored to fulfill legitimate public health, safety, or welfare objectives. (2) Articulate the reason(s) why the regulation is necessary to serve the specified objective(s). (2) Recommend to the legislature actions necessary to repeal or modify the entry regulation to conform to the standard of Section 4 if such action is not within the agency’s authority. (C) Within 15 months following enactment, each agency shall report to the legislature on all actions taken to conform with this section. (A) Any person may petition any agency to repeal or modify any entry regulation into a business or profession within its jurisdiction. (B) Within 90 days of a petition filed under (A) above, the agency shall either repeal the entry regulation, modify the regulation to achieve the standard set forth in Section 4, or state the basis on which it concludes the regulation conforms with the standard set forth in Section 4. (C) Any person may petition any agency to repeal or modify a public service restriction within its jurisdiction. (D) Within 90 days of a petition filed under (C) above, the agency shall state the basis on which it concludes the public service restriction conforms with the standard set forth in Section 5. (A) Any time after 90 days following a petition filed pursuant to Section 6 that has not been favorably acted upon by the agency, the person(s) filing a petition challenging an entry regulation or public service restriction may file an action in a Court of general jurisdiction. (2) Where the challenged entry regulation is necessary to the legitimate public health, safety, or welfare objectives, such objectives can be effectively served by regulations less burdensome to economic opportunity. (2) Where the challenged public service restriction is necessary to fulfill legitimate public health, safety or welfare objectives, such objectives can be effectively served by restrictions that allow greater private participation. (D) Upon a finding for the plaintiff(s), the Court shall enjoin further enforcement of the challenged entry regulation or public service restriction, and shall award reasonable attorney’s fees and costs to the plaintiff(s). (A) The right of individuals to pursue a chosen business or profession is a matter of statewide concern and is not subject to further inconsistent regulation by a county, city, town or other political subdivision of this state. This article preempts all inconsistent rules, regulations, codes, ordinances and other laws adopted by a county, city, town or other political subdivision of this state regarding the right of individuals to pursue a chosen business or profession. 1. See discussion at “North Carolina State Board of Dental Examiners v. FTC,” 129 Harvard Law Review 371, November 10, 2015. 2. North Carolina State Constitution, Article I, Section 1. 3. See discussion at Eric M. Fraser, “Opinion analysis: No antitrust immunity for professional licensing boards,” SCOTUS blog, February 25, 2015. 4. See “Economic Liberty: Opening the doors to opportunity,” web page of the Federal Trade Commission. 5. Maureen K. Ohlhausen, “Advancing Economic Liberty,” remarks to George Mason Law Review’s 20th Annual Antitrust Symposium, February 23, 2017. 6. Damon Root, “A Free Market Friend at the FTC,” Reason, January 2017. 8. “Occupational Licensing—Do We Need to Protect ‘the Public from Rogue Interior Designers Carpet-Bombing Living Rooms with Ugly Throw Pillows?’,” The National Law Review, March 9, 2017. 9. “Occupational Licensing,” The National Law Review. 10. “U.S. Secretary of Labor Acosta Addresses Occupational Licensing Reform,” press release, U.S. Department of Labor, July 21, 2017. 12. See, e.g., “FACT SHEET: New Steps to Reduce Unnecessary Occupation Licenses that are Limiting Worker Mobility and Reducing Wages,” press release, Office of the White House Press Secretary, June 17, 2016. 13. House Bill 692, North Carolina General Assembly, 2017-18 session. 14. House Bill 192, North Carolina General Assembly, 2017-18 session. 15. House Bill 199, North Carolina General Assembly, 2017-18 session. 16. House Bill 307, North Carolina General Assembly, 2017-18 session. 17. House Bill 358, North Carolina General Assembly, 2017-18 session. 18. House Bill 590, North Carolina General Assembly, 2017-18 session. 19. See, e.g., the list of occupations seeking licensing and other state regulations in the 2011-12 session of the General Assembly, published in Jon Sanders, “Guild By Association,” Spotlight No. 427, John Locke Foundation, January 28, 2013. 20. Robert Thornton and Edward Timmons, “The de-licensing of occupations in the United States,” Monthly Labor Review, U.S. Bureau of Labor Statistics, May 2015. 21. House Bill 2613, State of Arizona, Fifty-second Legislature, Second Regular Session, 2016. 22. See “FY 2016 Interactive Budget,” Office of Management and Budget, State of Rhode Island, and Thomas Mulvaney, “Technical Amendments to Article 20 of the FY 2016 Appropriations Act (15-H-5900), memorandum, May 22, 2015. 23. See, e.g., “Gov. Ricketts Signs First Occupational Licensing Reforms,” press release, Office of Governor Pete Ricketts, March 30, 2017, and discussion at Sarah Curry, “Strong Jobs Nebraska: The 2017 Occupational Licensing Review,” Policy Brief, Platte Institute, July 11, 2017. 24. Senate Bill 191, Connecticut General Assembly, Session Year 2017. See discussion at Rek LeCounte, “Nutmeggers Crack Open Occupational Licensing Laws,” Institute for Justice, July 14, 2017. 25. Senate Bill 2469, Tennessee General Assembly, 2015-2016. See discussion at “How-To Guide: Right to Earn a Living Act,” Beacon Center of Tennessee and National Federation of Independent Business, December 14, 2016. 26. Senate Bill 1437, State of Arizona, Fifty-third Legislature, First Regular Session, 2017. See discussion at Jon Riches, “SB 1437, the Right to Earn a Living Act,” Goldwater Policy Update, Goldwater Institute, February 14, 2017. 27. Governor Douglas A. Ducey, “Internal Review of Training Requirements, Continuing Education, Fees, and Processes,” Executive Order 2017-03. 28. House Bill 1425, Mississippi Legislature, 2017 Regular Session. See discussion at Eric Boehm, “This Mississippi Bill Could Be the Beginning of the End of Occupational Licensing Cartels,” Reason, March 31, 2017.